Mango season has been around for a while now and I have not posted any mango-related stuff…even though I’ve been eating so many. I usually make something or the other- either a crumble, a cake, or some good old-fashioned fruits with custard. And yes, some savory dishes as well, like a chutney or even a mango curry. This year, however, I’ve pretty much been eating them as is the entire season. I’ve had a near-perfect season. I haven’t encountered a sad or tasteless mango thus far. It’s been pretty darn good. So each time I bought mangoes, I’d just cut and eat them- I didn’t even feel like turning them into anything different. Until I realized that time is running out. (Gasp!) I’d be pretty pathetic if I didn’t reflect some kind of seasonal change on the blog right? Because I’ll be honest with you- other than seasonal fruit (mangoes, cherries, lychees, strawberries,) and corn in summer and red carrots in winter, I really don’t what seasonal produce to expect in India. Growing up in Kerala, there was mango season, monsoon and then the rest of the year. When I lived in Delhi, I knew winter had set in when those gorgeous deep-coral carrots arrived in the market. Considering I know so little about seasonal produce, I couldn’t let this mango season slip by. And I baked these cupcakes. The rain came in sideways on my balcony when I took this picture! Pre-heat your oven to 180 C and line a cupcake tin with liners. Sift together the flour, baking powder and cardamom powder in a bowl and set aside. In a large bowl, cream the butter and sugar together till light and fluffy. Take half the diced mangoes and place in a bowl. Sieve 2 tablespoons of regular flour over them, and gently combine with a spoon. 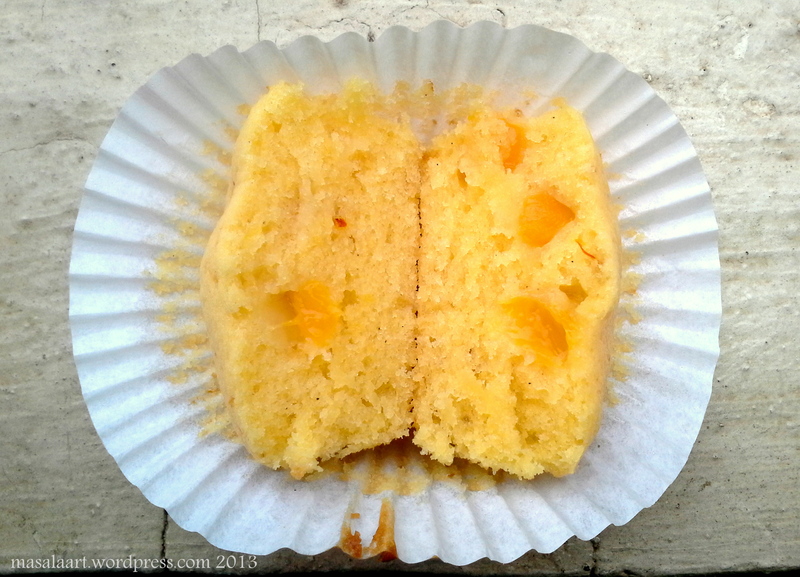 (This will prevent the mangoes from sinking to the bottom while baking.) Gently fold these mangoes pieces into the batter. Pour into cupcake moulds, filling batter 2/3 of the way up. Bake in the oven at 180 C for 25-30 minutes or until a toothpick inserted comes out clean. 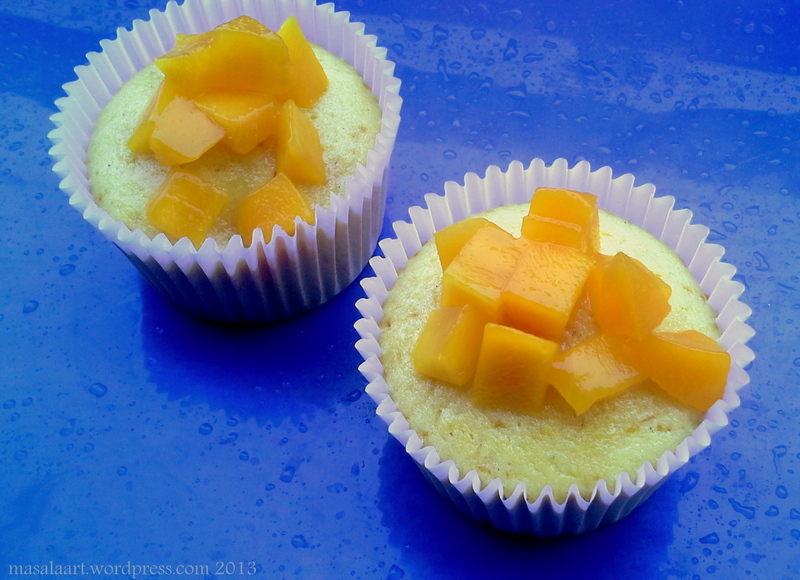 Take cupcakes out of the oven and allow to cool completely before adding diced mangoes on top. The fruit bits didn’t sink! Oh you make me miss mangoes so much! This is so delicious!